Municipal elections take place in municipalities across Metro Vancouver on Saturday, October 20 and we think it's important to understand local candidate positions on cycling. Every candidate for public office should have a transportation platform. Investments in all-ages and abilities (AAA) connected cycling lanes and facilities is what's needed to actually continue our progress towards meeting Transportation 2040 goals. Would your local candidates for mayor and council vote in favour of increasing cycling education, investment, and infrastructure that would #UnGapTheMap in your municipality and the region more broadly? And would they make these commitments within the next four-year election cycle? 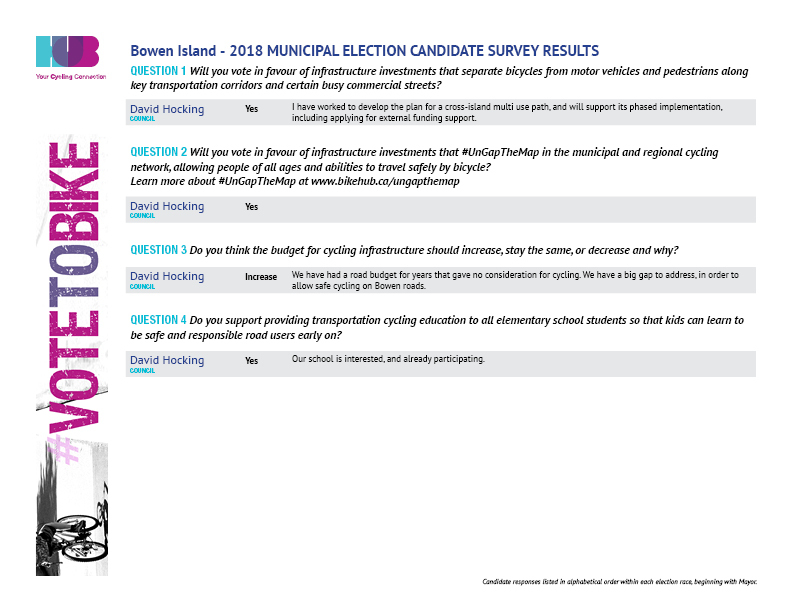 We asked Metro Vancouver candidates to complete a brief survey about their position on cycling, and the results are in! Subscribe to our newsletter to get regular updates delivered to your inbox.